We negotiated special rates for the following hotels. To get these rates please follow the "order & payment process". We recommend booking your rooms as soon as possible as since September is the main travel season in Prague. Send/Submit your Registration & Accommodation Form. You should receive a confirmation (your registration PIN) from ICARIS Ltd., a payment should succeed. Pay directly to ICARIS Ltd. (bank transfer, credit card). A payment of the first night deposit is a necessary condition for the acceptance of your reservation, the payment of whole prescribed amount is also possible. You should pay in the hotel only for your "extras" (phones, drinks, etc. ), your accommodation including breakfast will be paid by an invoice. A payment & accommodation confirmation will be available at the conference web page, arranged in order of conference personal identification numbers (PINs), without participant's names. 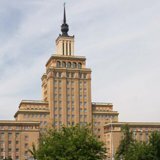 The deluxe Art Deco hotel is located near the Vaclavske Square. Fitness centre, sauna, solarium, parking, cooking classes. Hotel Diplomat offers 398 standard / superior rooms and suites. Three floors are reserved for non-smokers. Specially equipped room for the disabled is also available. Other Services: restaurants "Loreta" and "CD-Club", "Café Klimt", concierge service, hairdresser, newspaper & souvenir shop, antique shop, car rental, limousine service, garage, Business Service Centre, Relax Centre, room service. The 4-stars hotel offers comfortable accommodation in rooms, which are furnished in an Antique or modern Italian style. There is satellite TV, individually controlled air conditioning, minibar, telephone, safe deposit box, high speed Internet access and a hairdryer in every room. A small fitness centre, sauna and underground garages available. The hotel offers an accommodation in fully air-conditioned rooms. Other services: fitness centre, sauna, solarium, parking. The hotel offers standard services of a 3-star hotel. Swimming pool, fitness centre, parking available. A newly reconstructed hotel offers accommodation in 66 rooms with TV/SAT, telephone with direct dialling, safe, hair dryer, sanitary facilities. Relaxation centre, sauna, parking are available. 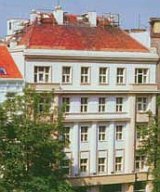 The hotel is situated in the Vinohrady historic residential area of the centre of Prague, not far from the Wenceslas Square. All rooms are furnished in Italian style and equipped with every comfort. They all have private bathroom, direct-dial telephone, minibar, safe and satellite TV. All rooms are fully furnished with the private social facilities (shower, bath, WC), telephone with direct call, TV - set with a large selection of the channels. A new modern 3-star hotel, all rooms are with bathroom, toilets, phone and TV-SAT. Hotel garages are available. 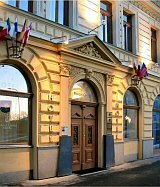 The hotel is situated only few steps from the metro station Dejvická. All rooms are furnished with their own bathroom with bath and toilet, television set with satellite programs, telephone, refrigerator. Parking may be provided in the close garages of the Diplomat Hotel. 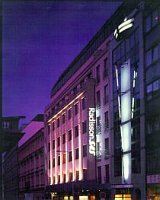 The hotel is easily accessible from the Prague International Airport. All rooms are with bathroom, SAT-TV, refrigerator, telephone, balcony. A large fitness centre within walking distance. Free parking. All rooms have bathroom with toilet, small kitchen, telephone and TV-set. An electronically guarded parking is available. The price includes a breakfast. All rooms have bathroom with toilet (common for 3 double-bed rooms), small kitchen, telephone and TV-set. An electronically guarded parking is available. The price includes a breakfast. The hostel offers an accommodation in a hotel style, all rooms are with social facilities and shower. 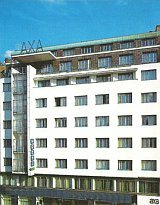 The rooms were completely refurbished in 2004. Without breakfasts. A simply furnished student hostel, room with shared shower and toilet. Without breakfasts.